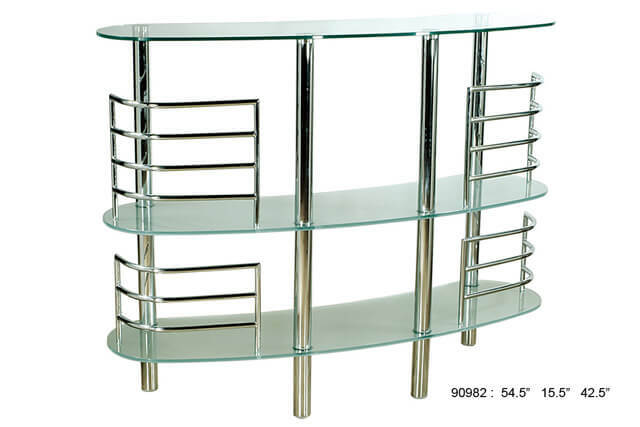 This is a contemporary 90982 Clear Bar Table. Richly decorated bar furniture. The 90982 Clear Bar Table is rich with decor composition of sleek steel work that would create a stunning look in your bar room area. Stately wrought three levels of tinted glass shelves. The elegant steel curves, running on every end compliment its smooth design. Graceful curves and classic style encourages the overall effect. 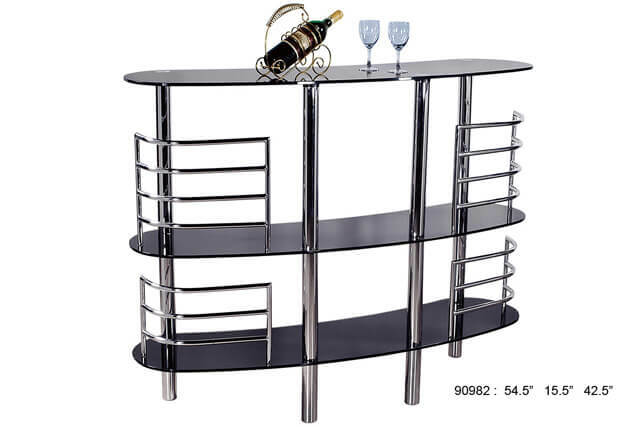 The 90982 Clear Bar Table is also available with black shelves. W54.5" x D15.5" x H42.5"
At Home USA was founded in 1959. It designs, produces and markets sofas, armchairs and living room accessories. At Home USA is the largest furniture company , and is a world leader in leather upholstery with 8% market share. Customer service and the entire sales network is managed by the USA headquarter based in NJ. In the furniture industry the At Home USA Company is one of the largest investor in research and development. Production is vertically integrated through 11 factories in USA and abroad (China, Brazil, Romania). Raw materials are purchased directly from the primary markets and then finished in the company’s facilities, specializing in manufacturing leather, wood and metal frames, foam and finished products. By controlling 92% of raw materials and semi-finished products, At Home USA guaranteed ultimate quality at most competitive prices. At Home USA products are hand-made by expert craftsmen committed to high quality standards. At Home USA guarantees a high level service to its customers: delivery at retailer’s premises, anywhere in the world, products invoiced in the retailer’s currency, and complete on-line pre- and post-sales assistance. At Home USA directly carries out the research and development of its products; plans its new factories; and develops the management information systems and the extranet that allow customers, everywhere in the world, to directly track and manage their orders.